'member when I posted the Jim Rice pic? That was postcard-size. In fact, since I photographed it on the Trivial Pursuit box, and you have the same game supposedly, you could use it for scale. Topps made these in the early 80s. The back only had the player's name on it, no stats. Then they had the 3-D cards which which also pretty big, and the player puffed out. I have a Goose Gossage one. They came one per pack. Then there was Topps Big baseball cards from the late 80s. Not postcard sized, but with stats. That might be the closest to your dream. 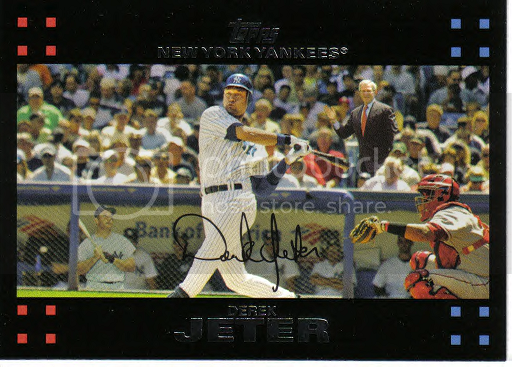 I saw this story on Olbermann about the Jeter card in your post--with Bush and Mantle on it. I looked all over the internet and couldn't find a pic--nor mention of it--anywhere. So, thanks for the pic, now I can e-mail it to my friend Brian.